From supporting the most vulnerable and disadvantaged people in society to the work of charities, community groups and businesses helping good causes, civil society is part of the fabric of our society. The UK Government want to have an open conversation about civil society, what is working well, and what the government can do to strengthen it further. If you want to help create a stronger civil society, we want to share your ideas on how Government can work with and support civil society. Have your day on how Government can work with and for civil society to tackle challenges and unlock opportunities to build a stronger society now and in the future. This consultation closes 9am on 22nd May 2018, and for more information or to take part click here! Locally Sefton CVS are facilitating a round table discussion to capture the views of local voluntary, community and faith (VCF) sector groups in relation to the Civil Society Strategy. The meeting will take place on Wednesday 9th May, 10am-12pm at the Sefton CVS Offices (click here for map), and if you would like to attend please email events@seftoncvs.org.uk, and please include details of any accessibility requirements. Alternatively please call 0151 920 0726 to book your place. Places are limited and are available on a first come, first-served basis. Sefton’s Lesbian, Gay and Bisexual (LGB) network Embrace are launching a new social evening in Bootle starting on Thursday 28th September and are inviting local LGBT residents to come along and find out more about the group. The evening will take place at Kindfulness Coffee Club on Knowsley Road in Bootle from 7pm until 8.30pm, and will be an opportunity for local residents to find out more about the Embrace network, meet new people, and access support and advice related to LGBT issues. Embrace is one of the Equalities networks supported by Sefton Council for Voluntary Service (CVS) and all lesbian, gay, bisexual and transgender people who live, work or play in the borough of Sefton are welcome to be involved. The network exists to be available to decision makers in Sefton and to be consulted on matters affecting the LGB community in Sefton. Embrace also provides a social and support outlet to LGBT people in the borough of Sefton. To find out more information about the Embrace social and support evening, please email embracesefton@gmail.com or call Embrace’s Co-Chairs Dr Mike Homfray on 07970 680483 or Rach O’Brien on 07903 773395. Residents can also follow Embrace on Twitter at @EmbraceSefton or find the group on Facebook. The achievements of community groups within Sefton have come under the spotlight with the launch of a new report. The Working Together For A Healthier Community report showcases the work of organisations and groups in the voluntary, community and faith sector after receiving grants from the CCG VCF Fund. Over more than three years, the two NHS Clinical Commissioning Groups (CCG) in Sefton invested £2.5million into projects designed to improve the health and wellbeing of local communities. 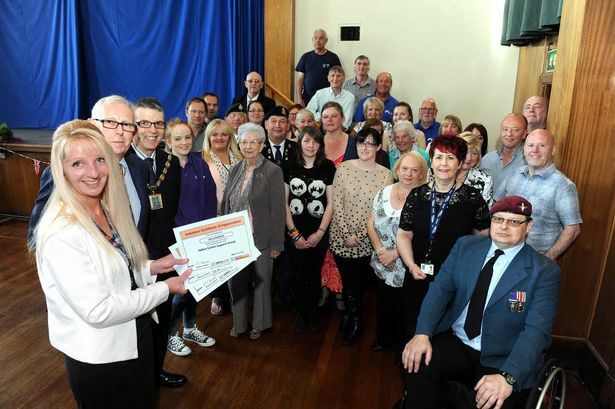 Fiona Taylor, Chief Officer at NHS South Sefton CCG and NHS Southport and Formby CCG, says: “The main aim of the grants was to improve people’s sense of inclusion and involvement which, in turn, helps their health, wellbeing and independence. There were 52 different projects delivered throughout Sefton ranging from those looking to tackle childhood obesity, reduce social isolation for older people or help people improve their mental wellbeing. More than 10,500 people engaged with the projects that delivered around 54,000 meals and more than 590 volunteers gave their time in supporting the projects. Please see the report here. A new Place of Welcome has opened in the Strand Shopping Centre in Bootle last week in the Strand by Me Centre which is a joint initiative by Sefton CVS, Sefton Council, South Sefton Clinical Commissioning Group and the Strand Centre. It offers an open approach to people shopping in the Centre and is also staffed by volunteers from the Strand House Residents Association and others. Pictured above are John Davis (second from left) with friends and visitors at the opening of the Place of Welcome which will be open to all comers on Tuesdays at 10am until 12 noon for refreshments. Places of Welcome harness people’s gifts and energies over a cup of tea and a biscuit and a warm welcome. Pop along anytime. Strand By Me is located on the ground floor of Bootle Strand Shopping Centre opposite Wilko, for more information click here! Click here for contact information of locations around the UK.